More Pace Than Flying Amy !! Won on 12 different tracks, including City Tracks in 4 eastern states. Won 14 of his first 26 starts in three states. Smashed Flying Amy’s first and sectional records at Dapto during the $100,000 series. Ran 2nd in South Australian Derby Final, 2nd in National Derby Final (beating Roanokee), won Geelong Cup Consolation and heats of Tweed Galxy, Gold Coast Cup and Traralgon Cup. Finalist in all those events plus the Darwin Cup( when the lure broke down when well clear). Golden Easter Egg semi finalist. HIS SIRE: – WORTHY REWARD – A race track champion breaking 5 Track Records, he was a Classic winner at Wentworth Park & made numerous big race finals in four states, including a win in the Lord Mayor’s Cup at Albion Park. Worthy Reward is the sire also of Nujooloo & Ibrox Park, champion racedogs in their own right. HIS DAM: Brute Girl – a smart galloper herself, she has produced many city winners including Deep North’s litter brother, Mareeba Man, Kalka Kate, Shin Char, Tiger Chariot & My Chariot. Her sire, Curryhill Brute is a sought after linege component by many astute breeders, with outstanding results. –Edward’s Affair –Finalist National Sprint Championship , Ipswich Track Record, Finalist 2002 Paws Of Thunder, 2nd 2002 QLD Sprint Final. Cruz Pro 2nd Group 2 2003 Bob Payne Winter Stake @ Wentworth Park, 59-20-18-8, Went Park 16-4-6-3 & $35,000. Gozo Prince – 3rd Peter Mosman Classic Semi Finalist –Russian Oak – Semi Finalist 2003 Australian Cup – Gozo Lantern – 41-11-9-4 & $ 14,000 – Vittoriano – Semi Finalist 2002 Paws Of Thunder. @ w/e 15/1/04 Deep North finished 2003 in 27th position on the National Sires list and had a very good strike rate of nearly 15%. 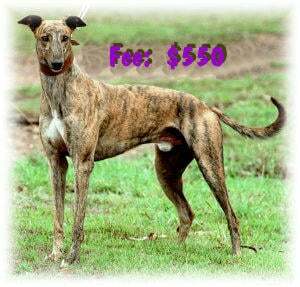 @ w/e 27/5/04 – 6 wins – Cruz Pro (bod) and littermate Pro Belle won at Gunnedah, Barnacle Bob BOM @ Ipswich. @ w/e 3/6/04 – 9 wins including some impressive maiden wins in BOM – Northern Call (x Call Me Katie) @ Mackay & Sugar State (x Sugar Beauty) at Rocky. Those 2 tracks may not be highly rated by some, but it’s a dam good run anywhere to run BOD in any maiden, Railroad Train won in BOM at Angle Park.